A Lagos-based lawyer, Mr.Daniel Onwe, has dragged the Federal Government and Academic Staff Union of Universities, ASUU, before a Federal High Court, Lagos, over violation of the fundamental right to the dignity of person of the affected students, who have been out of school following the union’s strike. The suit, FHC/CS/1360/13, was brought pursuant to Section 46(1) and (2) of the 1999 Constitution, Order II of the Fundamental Human Rights (Enforcement Procedure) Rules, 2009 and Article 5 of The African Charter on Human and People’s Rights (Ratification and Enforcement) Act, Cap. 10, LFN, 1990. Onwe is asking the court for a declaration that the indefinite strike leading to the closure of government-owned universities across the country violates the fundamental right to the dignity of person of the affected students guaranteed under Section 34 of the 1999 Constitution. 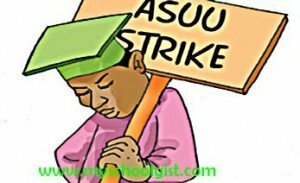 He is seeking for an order directing the Federal Government and ASUU to resolve their differences and forthwith re-open universities, including an order mandating ASUU to call off their ongoing strike action and resume their job of lecturing in the said universities immediately. Hearing on the suit, before Justice Ibrahim Buba, is on November 13.